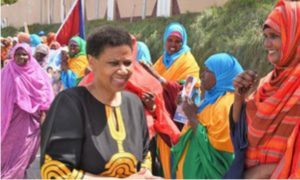 UN Women Executive Director Phumzile Mlambo-Ngcuka (left) interacts with women in Baidoa on her visit to Somalia. 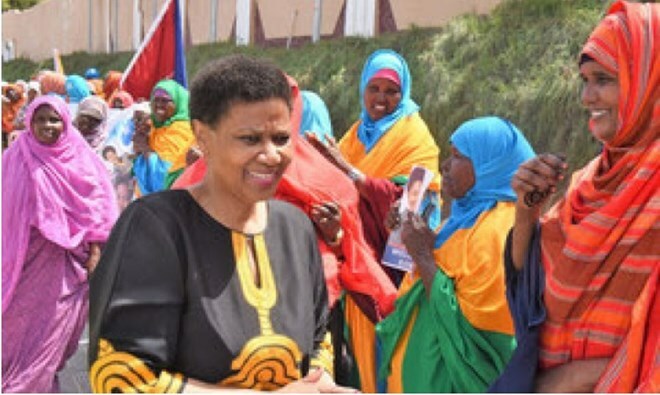 Ms. Mlambo-Ngcuka’s comments were made on Sunday in Baidoa, the interim capital of Somalia’s South West State (SWS), at the start of a three-day visit to the country, said UNSOM, the UN Assistance Mission in Somalia. Visiting as part of a delegation led by the Somalian Minister of Women and Human Rights Development, Deqa Yasin, Ms. Mlambo-Ngcuka met with the acting president of South West State, Hassan Hussein Mohamed, cabinet ministers, female members of the SWS regional assembly and civil society representatives. newinsideSomalia is currently reviewing its constitution, ahead of federal elections planned for 2020. The previous federal elections, in 2016, were held under an indirect suffrage system, which a report from UNSOM, released earlier this month, credited with the formation of a more diverse Parliament: almost a quarter of those elected were women, up from 14 per cent in 2012. The report called for the 2020 elections to establish a system of representation that is inclusive of all citizens, based on the one person, one vote principle. With the UN Official’s visit to Baidoa coinciding with World Humanitarian Day, Ms. Mlambo-Ngcuka took the opportunity to thank humanitarian workers in the country for their sacrifices and their dedication to communities who are targets of violent people and extremism. Since the beginning of the year, there have been an estimated 74 incidents of violence affecting humanitarian personnel in Somalia, resulting in the deaths of seven workers. A further 18 were abducted, and six are still being held captive. On arrival in the country on Saturday, the senior UN official met with Prime Minister Hassan Ali Khaire and Foreign Minister Ahmed Isse Awad in the capital, Mogadishu, as well as with women representatives from the business community, politics and civil society.